While the September 18 race is over, you can still donate to Komen for the Cure through October 31st. Blythe Masters was this years top fundraiser at $235,284.11, with JPMorgan Chase the top fundraising team at $455,654.69. You can make a donation on behalf of Blythe Masters by visiting her pledge page at the New York Komen for the Cure website and following the instructions. When you make a donation of $250 or more, you become eligible for pledge prizes too – learn more about the $250 challenge here. Thanks to all those who have already donated! 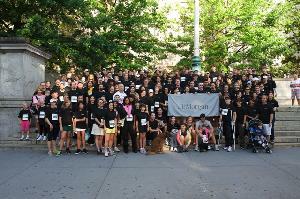 The race and fundraising efforts have been a tremendous success! Thanks to your dedication, New York’s Komen for The Cure raised $5.4 million in 2010, allowing us to award $4.8 million in grants this year! This year’s goal is $6 million. We need to raise more money than ever so we can help support local organizations providing breast health educational outreach, screening coordination and support and treatment services to underserved residents of the metropolitan area — whose numbers have been rising in these economically difficult times. Money will also go to fund clinical research enrollment and national peer reviewed research. Read more about supporting Komen for the Cure here. Today we’re reprinting another great and inspirational article about Blythe Masters from the Komen NYC website about fundraising for the annual Race for the Cure. You can read the full article, “How They Do It: Blythe Masters, JPMorgan Chase“, by clicking on the aforementioned title. There is still about a month left to fundraise for this year’s race. We’ll be posting updates as we go – get involved with a great cause! “Blythe Masters, JPMorgan Chase’s Global Head of Currencies and Commodities and Chair of the Komen Greater New York City Board of Directors, raised an extraordinary $161,950 for the 2006 Komen New York City Race for the Cure®. She is not only the highest individual fundraiser for the New York City Race but also, potentially, the biggest fundraiser for Komen worldwide. Masters’ involvement with Komen was triggered about five years ago by two things — one personal, the other professional. Her mother was diagnosed with breast cancer. At the same time, Lori Hricik, currently JPMorgan Chase CEO/Treasury Services, was drumming up people for the company’s team and invited Masters to a recruitment breakfast. Masters found the experience moving and decided to get involved. Masters approached senior managers and convinced them to match employee donations dollar for dollar. In 2006, they committed matching funds totaling $100,000. The program will be continued for the 2007 Race. To keep employees enthusiastic about fundraising, JPMorgan Chase hosts a breakfast, information sessions, a casino night and more. How can people forming a team be successful? Blythe Masters has consistently been the top fundraiser for Komen’s Race for the Cure. This article, however, shows how a little good-spirited competition can bring out the best in everyone and, more importantly, raise money for a vital cause. The story details how Blythe made a challenge to a room full of fundraisers in 2007 to unseat the JP Morgan Chase team as the top fundraising team in the race. Joseph Gold, Managing Director and Head of Capital & Liquidity Management at Barclays Capital (who is also now a Komen Greater NYC Board member and Audit Committee Chair), took Blythe up on the challenge and raised $90,000 in a week for the Komen Greater NYC Race. Despite his valiant efforts, however, JP Morgan finished out that year and the next two as the top fundraiser. 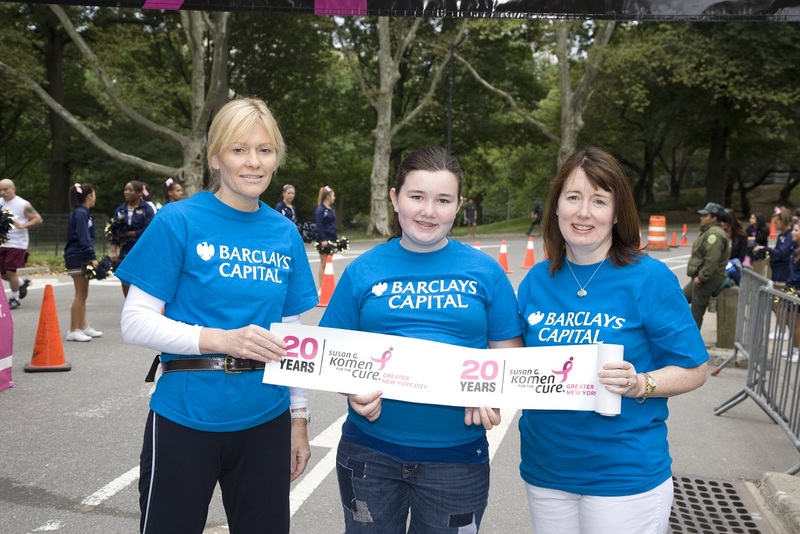 This finally changed in 2010 when Barclays Capital raised an astounding $290, 822.27 for the 2010 Komen Greater NYC Race for the Cure, outperforming their nearest rival, JPMorgan Chase by $46,000! Who will win the honor this year? If you would like to make a donation on behalf of Blythe Masters, click here. 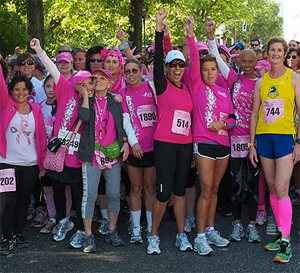 If you live in the New York area and would like to participate in the Komen’s 2011 Race for the Cure on the JPMorgan team, click here. 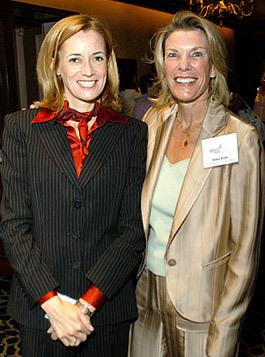 Blythe Masters is Board Chair of Komen Greater NYC, the Greater New York City Affiliate of Susan G. Komen for the Cure. Komen for the Cure is an organization that offers support and help to those of us touched by breast cancer. Click here to Blythe Masters‘ entire entry as well as more about Komen for the Cure.